While I love discovering new things, I am a traditionalist at heart. This means that for holidays like Thanksgiving and Christmas, I serve the same main entrees every year. As an Italian, Christmas Eve has its own traditional menu. This celebration, La Vigilia di Natale (The Vigil of the Birth), is also known as The Feast of the Seven Fishes. I know that we eat fish because Christmas Eve is a Holy Day of Obligation in the Catholic Church, but I have never gotten a satisfactory reason for why we have seven fish. In fact, some people serve twelve dishes for the feast. Over the years, I’ve heard various explanations of what the number of fish served at this meal represents, but none of them have anything, in particular, to do with the birth of Jesus Christ. Nevertheless, at the risk of sounding like Tevye in “Fiddler On The Roof,” it’s tradition! Every year when I was growing up, we traveled to my grandmother’s house for, what my sisters and I fondly referred to as, the “Fish Fest.” And every year Gran’s table swam with a stunning abundance of calamari, baccala, smelts, whiting, sardines, anchovies, and eel. Believe it or not, in addition to all the fish, she also made a giant bowl of homemade spaghetti with an oil-based tomato sauce, an antipasto platter, and a dish of sauteed savoy cabbage. My dad and uncle always ate so much that after dinner they would lay on the living room floor in a food coma and unbutton their pants for a while before we could open our presents. The meal was so epic that we all gorged ourselves and didn’t even care that our clothes and hair were infused with enough fishy goodness that in church afterward, people would sniff the air and turn around in their pews to see who had spent the evening rolling around in the hold of a fishing trawler. I have no idea how my grandmother ever got that much “essence of fish” out of her house. Today, unfortunately, neither my kids nor my husband are big fans of seafood, so it would be a waste of good fish to prepare the Feast of the Seven Fishes for my picky family. However, I feel that honoring our traditions is vitally important because tradition connects us to our past and grounds us as we face the future. So instead of making all my Gran’s delicious pesce, I observe our tradition by making a single shrimp dish as well as her oil spaghetti. Because I don’t have to spend all day preparing a seafood extravaganza, I have time to devote myself to setting a festive table for our “Feast of One Fish.” And maybe, since there seems to be no consensus about the appropriate number or meaning of the fish that should be included in this feast, our celebration is just as significant as any other Christmas Eve dinner. 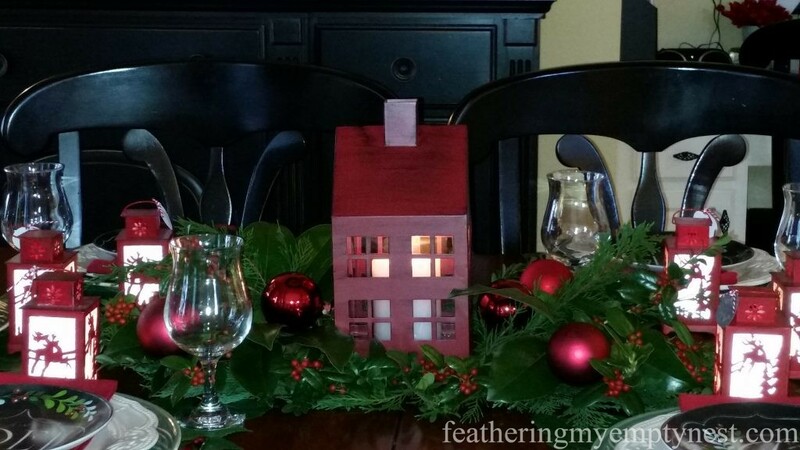 This year I decided to build my Christmas Eve table setting around these adorable red lantern ornaments from Pier One. They are great on the tree because, while they look like tin, they are made primarily of cardboard and are super light so they can be hung on the flimsiest branches. However on my table, since they light up, they function as votives at each place setting. They also serve as place cards, as I attached personalized chalkboard Christmas labels (downloaded for free from Lia Griffith’s awesome website) to each lantern. 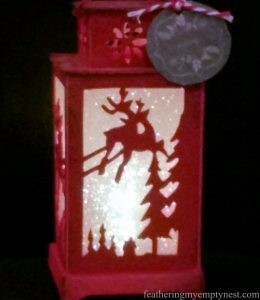 This red house lantern is the focal point of the centerpiece. I nestled it among cedar branches accented with boxwood, magnolia, holly, and red Christmas ornaments. 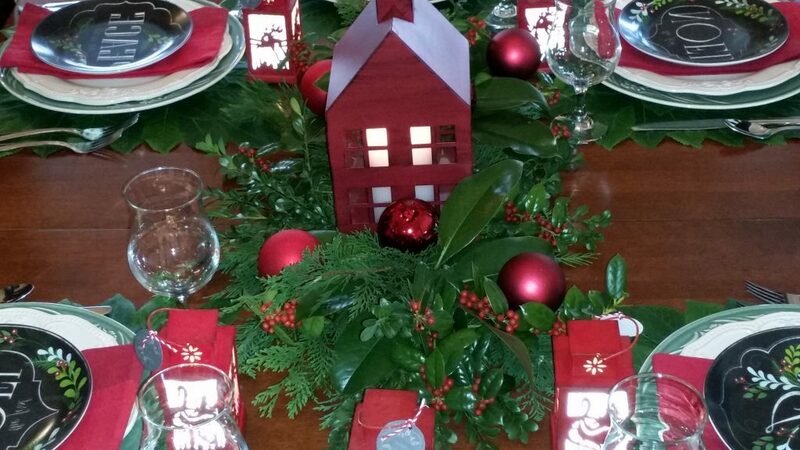 Each place setting is comprised of lemon leaf placemats topped with old Lenox “Poppies Rainbow Green” chargers, cream embossed dinner plates, red hemstitch napkins and Christmas themed chalkboard salad plates. Note: My grandmother’s basic sauce contains salt pork or fatback, but because meat is prohibited on Christmas Eve, the Feast of the Seven Fishes sauce is started with oil. In a large stock pot lightly brown garlic cloves in the olive oil. Add crushed tomatoes, tomato sauce, tomato puree and a cup of water. Simmer for 4 hours until desired thickness is attained. My Italian Catholic family also does an annual “Fish Fest” and we always walk into mass afterwards smelling like a bunch of “garlic eaters” (to quote Mr. Potter from It’s a Wonderful Life) but I wouldn’t have it any other way! 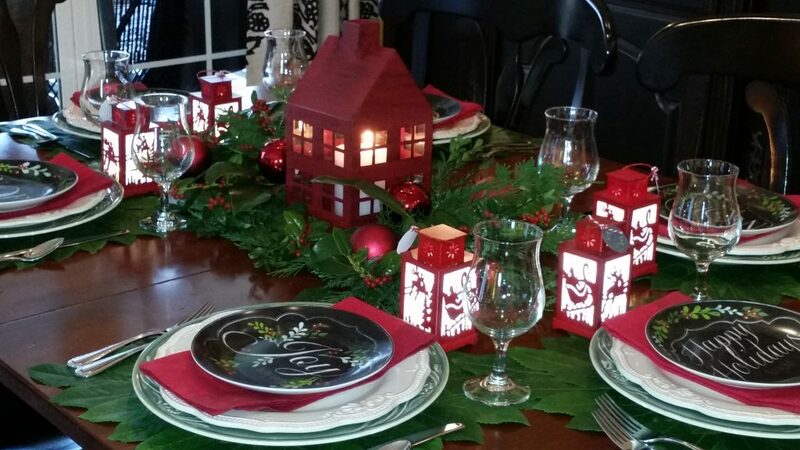 The table is beautiful, I love all the lanterns– looks like Christmas magic! What, no “sissy girl” or vomit alley?! I love those placemats. I don’t think I have seen anything like it before. I can’t believe your grandmother made all that food! What a labor of love. I can easily imagine people lying on the floor in a food coma afterwards – I think I’d be one of them. The lantern ornaments are adorable. With the lights turned off, I can imagine how beautiful it’s going to be. I love the lanterns! I have a couple of them on my tree this year, and they add a charming glow. In this day and age, it’s so great that family traditions are kept alive. 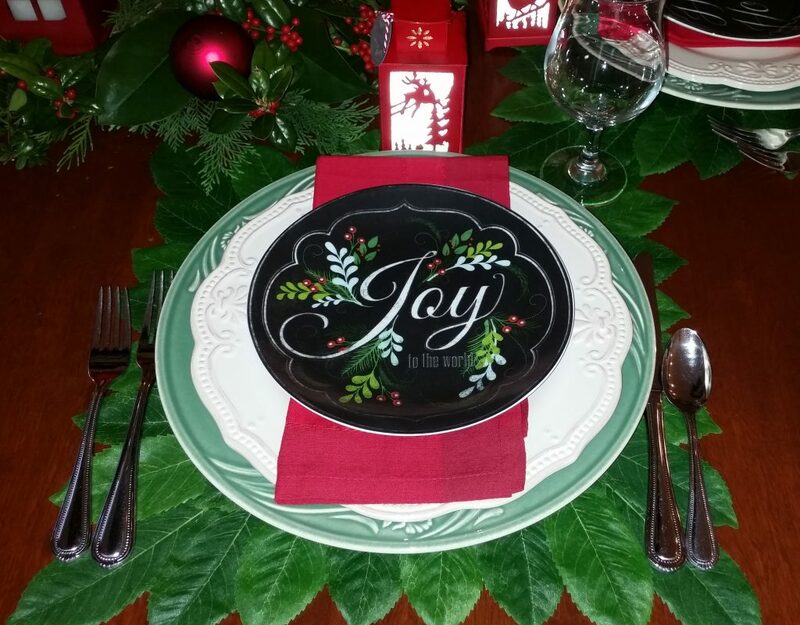 You’ve set a beautiful table and the “joy” plates are so pretty. Thanks so much for your kind comment, Sandra. I agree with you that it’s important to keep family traditions alive. 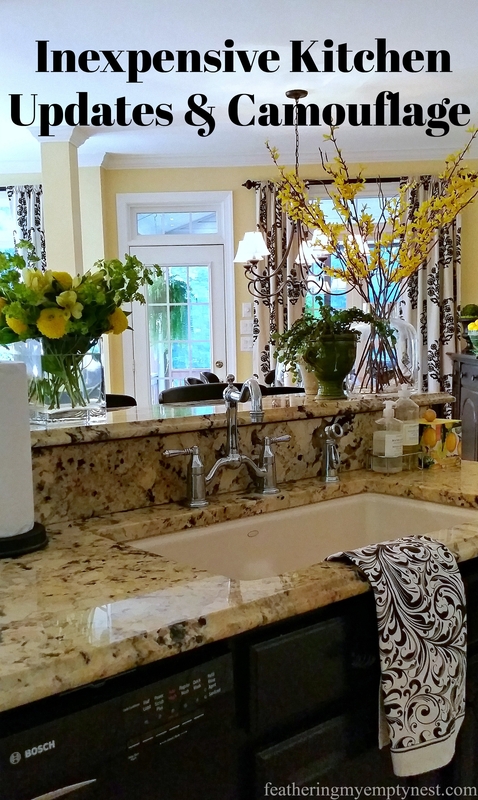 When I look back at everything my grandmother used to do, I just don’t know how she did it! I love tradition too especially at Christmas and enjoyed hearing about the “Fish Feast” and seeing how you set that beautiful table! Thanks for your kind comment about my crazy modern Fish Fest. I really appreciate it. Buon Natale! It was so much fun reading about your family traditions! It sounds like a wonderful family time! 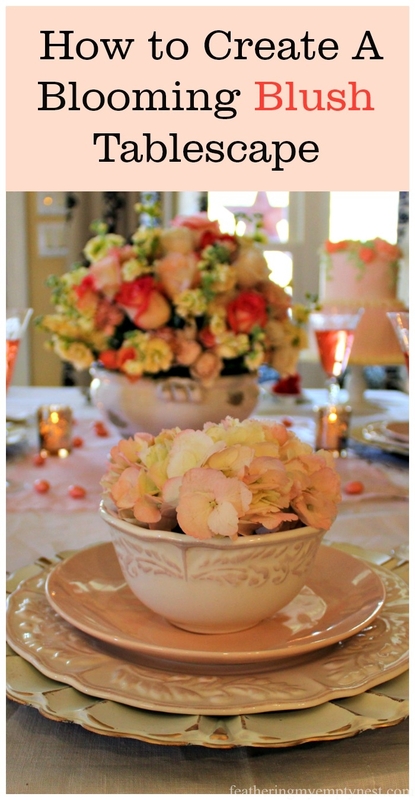 Your holiday table setting is beautiful! Thank you for sharing with us at Party in Your PJ’s! Thanks so much, Teresa, for your kind comment about our family’s modern “Fish Fest.” Thanks also for hosting Party In Your PJ’s. What a fun description of your Grandmother’s feast! I can just picture the whole thing! Such a shame your family doesn’t like fish, so you can repeat the experience & tradition, but anyway, your table looks lovely! 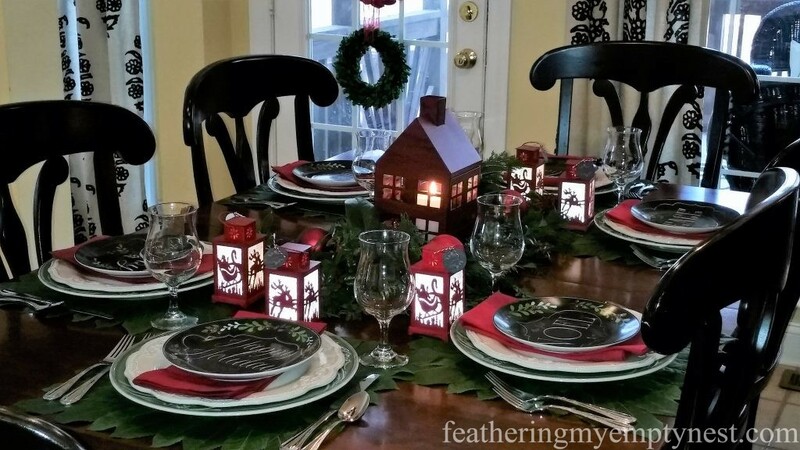 The little red houses and lanterns are superb, and really make that table, and love the dishes you chose for your place settings. Just beautiful. Thank you so much for your kind comment about my family’s Christmas Eve Fish Dinner. My grandmother was a very special person and it’s important to me to honor her and keep her memory alive by keeping up her traditions. I love that you took your family’s tradition and made it work for your family. My husband is a shrimp lover so he would love that! I don’t know a lot about Italian Christmas traditions so this was interesting to read. Thanks so much for linking up today! Thank you so much for your kind comment. I wish you and yours a very Merry Christmas! Thanks so much for your kind comment about my “fish fest.” I really appreciate it. I wish you and yours a very Merry Christmas and a Happy New Year!